As is always the case with this client, the email arrives with pictures of the highest quality and detail. A quick look at the picture of the two lower bouts immediately reveals that the two pieces which form the belly are from separate trees – at a guess, about 70 rings on the bass side and maybe 100 on the treble. Different trees on a soundboard is not an unusual situation. I use a software module to measure the rings on-screen, repeating this process twice to ensure that no rings are omitted or added erroneously. I test the bass side first, to see if anything comes up readily from the cross-dating. Cross-dating is initially a statistical operation, which calculates the correlation between two ring-series. This is followed by visual graphical comparison of the ‘matching’ files. The results are expressed in a parameter called the ‘Student’s t-value’, which computes the significance of these correlations, taking into account the length of the ring sequence. A t-value is said to be statistically significant when it exceeds a value of 3.5. However, at that level, many correlations obtained are not to be relied upon in order to deduce a true relationship. When their level reach values over about 5, we can start looking seriously at a genuine temporal match. In the rare instances of a t-value result exceeding 10, the possibility of a same-tree relationship can be explored. I proceed with the cross-dating of the bass-side series, as I do for every test, against the whole of my database. This includes thousands of ring patterns from various instruments’ soundboards, including violins, violas, cellos, guitars and keyboards, as well as geographical references, many of which are published by the International Tree-Ring Data-Bank (ITRDB). This automated process identifies the most significant correlations and lists the results in decreasing order of t-value. It also highlights unbiased relationships, as the database contains information from instruments of every available source, location and period. After loading the new data from the bass side into my cross-dating software, the results take a few seconds to run through the millions of calculations and the list of results soon appears. ‘Strad!’ I think to myself, as the name Antonio Stradivari appears on the first five lines of the output. Next to the names of the files are those of the specific instruments they refer to: 1715 ‘Titian’, 1717 ‘Reiffenberg’, 1718 ‘Prove’, 1715 ‘Alard’, 1712 ‘Fontaine’. The next column, where the t-value has been recorded for these instruments, shows them to be exceedingly high, ranging between 11.3 and just over 14. This is a terribly exciting set of results, as it allows for the consideration of a same-tree association between the instruments. The next step is to assess the similarity of the ring-patterns plotted by ring-widths on graphs. As with every scientific discipline using statistics, one has to be careful that results don’t just point to ‘any correlations’, but to a true temporal match. The particular method here and the statistical formulae used have been integrated into professional cross-dating software for many years and have been found to be effective in identifying these temporal relationships between separate ring-patterns. Naturally when the first five most significant results out of thousands of ring-patterns are from Stradivari instruments, the probability of these being coincidental is pretty remote, although they point to a connection between the wood used, and not necessarily to a particular maker. The first graph, representing data from the bass side with data from the 1715 ‘Titian’ Stradivari looks very convincing, and confirms the likelihood that we are looking at pieces of wood from the same log. In fact, all five of the examples identified reveal analogous patterns. We cannot and do not expect an exact match between these ring-series. The rings within a tree are never perfectly concentric, and show some natural variations between samples. Even within the same piece, the ring measurements will never be identical when measured at a slightly different level, which makes the findings here more compelling. In any case, the results show that the youngest ring on the bass side of the instrument being tested dates from AD 1701. The treble side, as mentioned, is quite different and contains more rings: 102 compared with 71 on the bass side. A similar process of measuring and cross-dating reveals further exciting results – some of the most thrilling I have yet come across. At the very top of the list of cross-dating results stands the ‘Messiah’ of 1716, the ever-controversial violin in the Ashmolean Museum, Oxford. With a t-value of 11.25, it again suggests the strong likelihood of a same-tree match. The first four most significant correlations are three violins by Stradivari and one by Pietro Giacomo Rogeri from 1710. Again surely not a coincidence! 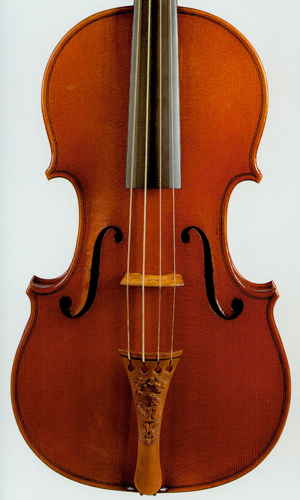 This Rogeri was itself the subject of a dendrochronological investigation by the Munich-based violin maker Arjan Versteeg, the results of which were published in The Strad magazine in March 2011. These concluded that the wood on one half of the Rogeri came from the same tree as that of the 1716 ‘Messiah’. Although some same-tree matches between the ‘Messiah’ and other Stradivari instruments have been suggested by past analyses, particularly following research by British dendrochronology expert John Topham, none has so far reached the level of t-value seen here against our treble side. The essential plotted data comparison again reveals an extremely close relationship between this treble side and the treble side of the ‘Messiah’ in particular. In fact the statistical relationship, in the form of the t-value, between the two halves of the Messiah belly is far inferior to the one seen between the treble side of the two instruments. This would suggest that the matching pieces from these two instruments were originally located closer within the log than the two pieces forming the belly of the ‘Messiah’. The range of t-values identified between the various Stradivari instruments, the Rogeri and our treble side, associated with the study of the comparative graphs, suggest that if we are in the presence of wood from the same tree, which appears very likely, this tree may have suffered some inner trauma, such as a phenomena known as ‘compression wood’. 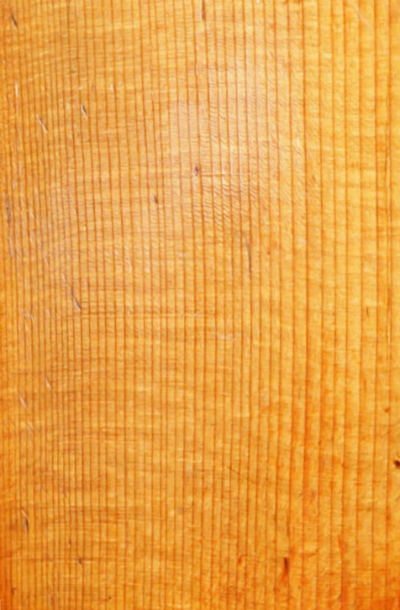 This type of occurrence is present in many trees to varying degrees and can skew parts of the ring-widths and affect the concentricity of the rings, often shifting the position of the initial (oldest) rings well away from the geometrical centre of the log, as well as affecting the response of the ring-growth to environmental factors. This in particular can make a series very difficult to date. However, the ‘Messiah’ wood has been dated conclusively by John Topham, and subsequently confirmed by the team led by Henri Grissino-Mayer of the University of Tennessee, and the data were published in the ITRDB. Since then, a large number of analyses have supported this dating. These results all place the latest ring of the treble side of the violin under investigation at AD 1689. Excited by the findings, I phone the people who commissioned the test to find out what the instrument is. They reveal it is indeed an Antonio Stradivari violin: the ‘Ex-Wilhelmj’ of 1724. Essentially, the analysis shows that a number of wedges of the two separate trees were present in the Stradivari workshop. Wedges from one tree were used in the 1710s to manufacture important examples such as the ‘Titian’ and the ‘Alard’; wedges from the other were used in the construction of the ‘Messiah’ and another example from 1717; while pieces from both trees, probably leftovers from the previous decade, were jointed together in the belly of the 1724 ‘Wilhelmj’. The bellies of the other Stradivari instruments mentioned, including that of the ‘Messiah’, appear to have matching halves, although not necessarily book-matched. Of course these revelations do not constitute absolute proof that the ‘Messiah’ was made in 1716 in the workshop of Stradivari, and no doubt controversy surrounding this instrument will continue, but the mounting dendro-organological evidence is increasingly supporting the attribution of the ‘Messiah’ as a genuine, correctly dated example from the Stradivari workshop. Violin maker Peter Ratcliff is an expert in the dendrochronology of musical instruments.